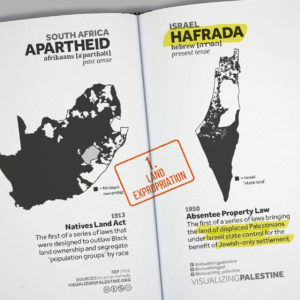 By Palestine Solidarity Campaign – PSC today published new graphics showing the parallels between state policies in apartheid-era South Africa and those of contemporary Israel towards Palestinians. 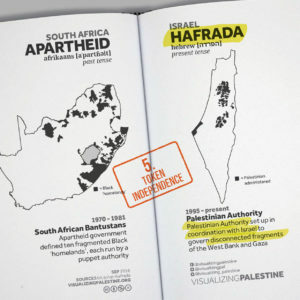 The visuals, produced by Visualizing Palestine, were co-released in the run up to our conference “Justice in Palestine: Ending Apartheid, Achieving Freedom and Equality”, where the graphics will be exhibited publicly for the first time worldwide. 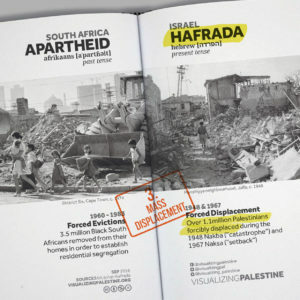 Israels policies toward Palestinians are often described in Hebrew as hafrada (“separation”), a word strikingly similar in meaning to the Afrikaans word apartheid (“separateness” or “apart-hood”). 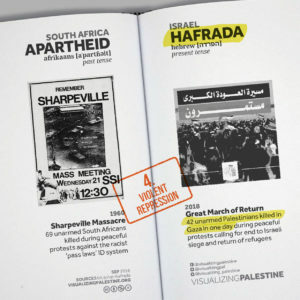 Although there are substantive differences between the policies of the Israeli government and those of the apartheid regime in South Africa, a 2017 UNESCWA report found that Israeli policies and practices meet the legal definition of the “Crime of Apartheid” as defined by the Rome Statute of the International Criminal Court. 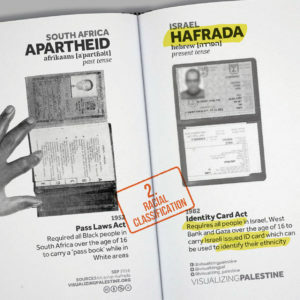 In July, the Israeli Knesset passed the Nation-State Law, making its discriminatory policies all the more explicit. View the graphics below, or on our Twitter, Facebook or Instagram pages. 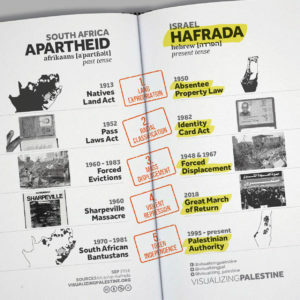 To view more brilliant infographics about life for Palestinians living under Israeli apartheid, visit the Visualizing Palestine site. A limited number of tickets for our conference are still available. For more info and to book, click here.